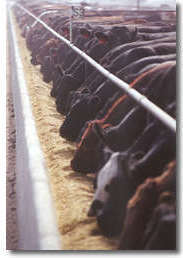 Magnum Feedyard Co. LLC began operations July 1, 1994 with the acquisition of a 5,500 head feedyard. With a philosophy focused on competitive performance and outstanding customer service, the honesty and integrity of our ownership and management team has allowed our feeding company to flourish to our current capacity of 22,500 head. Although our employee team is young and aggressive, most have been with us from the start. We believe in a philosophy that "people do business with people". This is underscored throughout our customer base, vendor list, and employee roster.